Mark Carney, the Governor of the Bank of England, today described the prospect of a British secession from the European Union as the “biggest domestic financial stability risk” facing the UK. If Britain left the EU and could not secure the same business conditions for the City that it enjoys today, it would “without question” hit UK jobs and growth. The success of a new relationship with the EU after leaving would depend on the “degree of mutual recognition enjoyed by the UK. Would the City be able to hold on the “passporting rights” that facilitates cross-border business in the European Economic Area, i.e. the EU plus Norway, Iceland and Liechtenstein? There is little doubt that the markets may jitter at the prospect of the referendum, so Mark Carney is speaking the truth when he warns of uncertainty. This in itself is not a good enough reason not to hold one; democracy is necessarily uncertain at times. HSBC previously warned it would relocate in the even of Brexit, until the board voted to remain in the UK in a decision that drew a line under almost a year of uncertainty over the future of Europe’s biggest bank. Banks and business do not like the prospect of change or the risks associated with the people expressing themselves democratically. However, the reasons for HSBC remaining in the UK apply to every bank that warns it may relocate if Britain leaves the EU. Stuart Gulliver, HSBC’s chief executive, said HSBC’s current location “delivers the best of both worlds to our stakeholders.” He added that said Britain’s “internationally recognised” regulatory framework and legal system, as well as its workforce, meant the UK should remain HSBC’s home. There is in no perceivable advantage to leaving London; it is a first rate global city that will remain a global hub in or out of the EU. As for Britain’s “internationally recognised” regulatory framework, Britain has adopted global regulatory conventions made at the real top tables where the rules are made, and would do so in or out of the EU. From a regulatory perspective, there is zero competitive advantage in moving away from London. Why relocate to mainland Europe in a post Brexit scenario? Nowhere would the business environment improve, there are no tax advantages to moving to Paris, thus it would be a waste of time and resources. In any case, in order to secure the economy and de-risk Brexit in the event of a vote to leave, the Government will inevitably seek to retain access to the Single Market in a mutually beneficial negotiated settlement. The Market Solution is the optimal solution for alleviating risk, calming uncertainties and seceding from political and judicial union in an orderly fashion. From there we have a secure platform from which to exploit the benefits of independence; I tis our departure lounge not our final destination. We will necessarily evolve out of the EU in stages, in that way Brexit is a process, not an event. At the prospect of the UK retaining Single Market membership after leaving the EU Mark Carney expressed concerns. He stated that there would be questions over whether the UK would lose its “substantial influence” over the development of EU financial regulations and would retain the flexibility achieved in the renegotiation settlement secured by David Cameron. This is of course the standard criticism of the so-called “Norway option” that is commonly used to downplay the benefits of forging a relationship with the EU based on cooperation and trade alone. As ever, there is an international elephant in the room. What Sir Jon Cunliffe chose to obscure is that the banking industry is global and so, increasingly, is its regulation. In fact, there has been what has been described as a “Cambrian explosion” in international regulatory co-operation which has transformed the regulatory environment. This means that pulling out of “Europe” would not make any difference to the trading environment – power is no longer geo-located in Brussels (if it ever was). Our EU parochialism is preventing us from seeing the bigger picture. Conveniently, the extent of this transformation has been charted by the OECD and by researcher from Arizona State University. And in their documents we see this helpful chart (below) which sets out the structure of global financial regulation. Readers will observe the focal position of the Financial Stability Board (FSB) and the remarkable number of organisations that make rules, set standards and co-ordinate regulation within this crucial field. But they will also note the relatively inconsequential position of the EU, which is a downstream organisation when it comes to framing regulation. 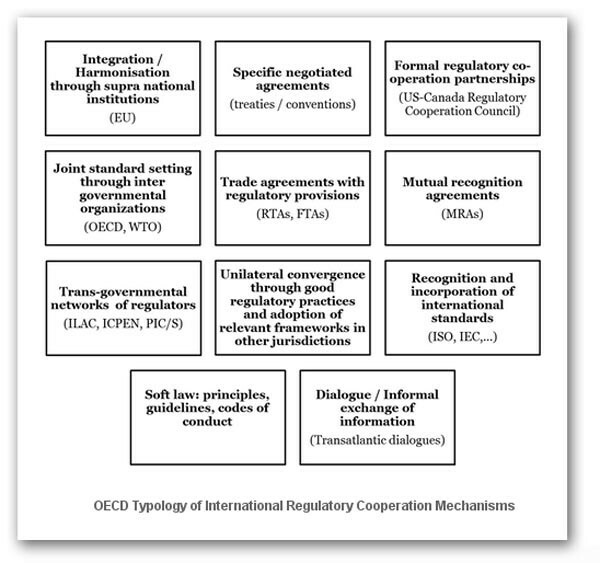 But this is all part of a much bigger picture, which goes under the classification International Regulatory Co-operation (IRC), as charted by the OECD. Not only has it recorded a staggering proliferation of organisations involved, the OECD, after an initiative launched in 2010 has identified eleven “mechanisms” of IRC, ranging from the formal and comprehensive to the informal and partial. These run to harmonisation through rule-making by supranational or joint institutions such as the EU, treaties between states, regulatory “umbrella” partnerships such as the Canada-US Regulatory Cooperation Council, and intergovernmental organisations such as the ILO, OECD and WTO. The territory also includes regional agreements on regulation such as APEC and UNECE, mutual recognition agreements, transgovernmental networks such as the Basel Committee on Banking Supervision, national requirements to consider international standards, incorporation of international standards in national law, soft law instruments and dialogue/information exchange among regulators and stakeholders (see diagram below). 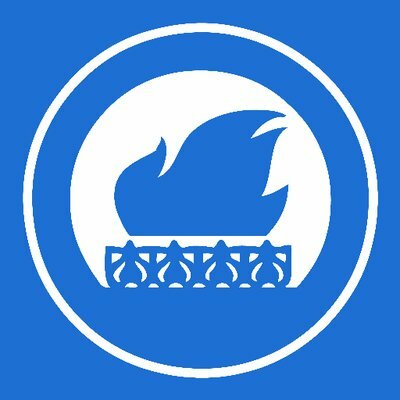 The UK government is fully involved, as is the US government, where IRC is subject to a Presidential Executive Order, with action directed through the Office of Management and Budget. And it drives trade relations between the US and Canada. Yet, while writ of IRC is dominating the global regulatory environment, it is almost completely invisible to the media, to most politicians and commentators. This means that most of what we are told is superficial to the point of misleading. The way we are governed has undergone a revolution – an invisible revolution – and the mass media is not even close to putting us in the picture. Instead, it gives succour to the propagandists, who would have it that the “Europe” of which they know so little is one which is essential to UK trade, unwilling or unable to recognise that, in this changing world, we can live without the political ambitions of the EU and do better on the global stage. The point they cannot seem to cope with is that globalisation has now advanced to such a stage that the original justification for having the EU running the European trading bloc has long since expired and we need to create a genuine European marketplace. “Europe” isn’t working, and we need now to look for a new settlement, of which IRC is a major part. If we leave the EU, the banks won’t flee, London will remain a foremost global city and Britain will embrace an outward looking vision. There is a global single market emerging, and we need to be fully engaged with it.